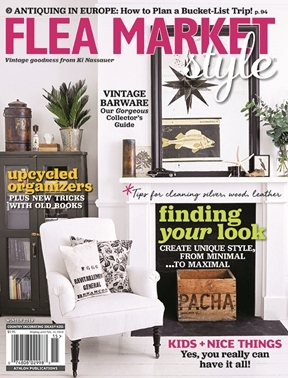 For those who love the thrill of the hunt and the challenge of turning fabulous finds into one-of-a-kind décor, Flea Market Style is the go-to guide for professional collecting advice, inspired decorating and entertaining ideas and original “junkover” projects that take upcycling to a whole new level. Each issue also features the best shops, markets and shows across the country for unearthing hidden gems and great bargains. Digital Subscriptions Now Available - Read issues on your Phone, Tablet or Desktop Computer. You will receive an email notification with each new issue available. With the purchase of any digital subscription, you will also immediately receive the current issue, at no extra cost!